We were the first jeweler in the United States to promote Canada as a source for ethically mined gemstones and have worked closely with the Canadian diamond industry as its international stature has grown. In our quest to provide customers with diamonds from verifiable origins, Leber Jeweler Inc has worked with high quality, well-cut diamonds from Canada’s Northwest Territories since the 1990s. Canadian-origin diamonds have set the standard for responsibly mined diamonds. Meeting and often exceeding Canada’s environmental laws, developers of mining projects have made efforts to incorporate the local indigenous communities into the process. Local economies have benefited from the relatively new mining operations since they launched in the 1990s. (A recent study showed the only First Nations communities in northern Canada that were economically viable were those that possessed diamond or other natural resources.) While illicit diamonds brought Canada’s diamonds to the world’s attention, the environmental issues remain a key component of the Canadian process. 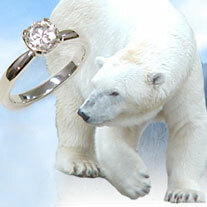 At present, Canadian diamonds still are the only single source diamond that offers verifiable country of origin. Leber Jeweler Inc offers Canadian diamonds as a paradigm of how diamonds can best be mined and processed in ways that help local communities without undue harm to the Earth. Despite this committment to Canada for our diamonds, we hold much hope for Africa. We continue working on several projects to source African-origin diamonds that offer a fair and equitable return to the people of this very diverse continent without offering revenue to brutal regimes who fund ongoing violence from the sale of precious gems. While at this time, no African sourced diamonds meet our standards for conflict free, we persist based on our success with the development of multiple small scaled colored gemstone projects in Africa. We also will continue to work in an advisory role with human rights organizations and the US government to encourage sustainable development in Africa through a variety of initiatives.